Atlantic City’s gaming revenues have been subject to an onslaught over the past few years as the market’s monopoly on Northeast gaming has shrunk. Casino growth in Pennsylvania and other neighboring states have taken away business. Gaming expansion is continuing up the Eastern seaboard. Between 2006 and 2011, Atlantic City’s gaming revenues declined 38 percent. For example, a second casino is being planned for Philadelphia, which is just an hour’s drive away. The $2.4 billion Revel opened on the Boardwalk in April but hasn’t been the savior that many Atlantic City observers hoped. In addition, Revel’s operators warned in Securities and Exchange Commission filings the property could face bankruptcy or foreclosure because of its $1.3 billion debt. Revel Chief Executive Officer Kevin DeSanctis said in a statement he has confidence in the casino’s marketing strategy and business that canceled because of the storm would return. Farrell warned any boost in Revel’s numbers could be at the detriment to its competition. “Existing operators could see further revenue cannibalization and margin compression, especially on the Atlantic City Boardwalk,” Farrell said. 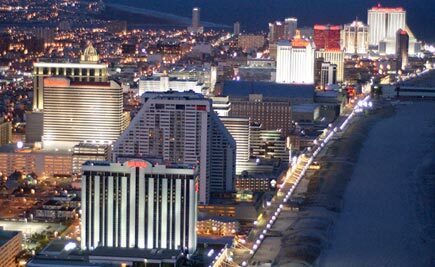 Caesars Entertainment Corp. operates four of Atlantic City’s casinos and company executives have publicly stated their support for the market. PokerStars, which was kicked out of the U.S. by federal prosecutors 20 months ago, is reportedly interested in buying the struggling Atlantic Club on the Boardwalk. The deal is contingent on New Jersey legalizing online gaming. A bill is currently under debate in the legislature, which would allow gamblers to wager on the websites – operated by Atlantic City casinos – from within New Jersey’s borders. The Division of Gaming Enforcement all but kicked MGM Resorts International out of Atlantic City in 2010 when it decided Hong Kong businesswoman Pansy Ho, the company’s joint venture partner in Macau, was unsuitable. Howard Stutz’s Inside Gaming column appears Sundays. He can be reached at hstutz@reviewjournal.com or 702-477-3871. He blogs at lvrj.com/blogs/stutz. Follow @howardstutz on Twitter.